2013 has seen large numbers of local police forces issuing warnings to residents about garage security. Bikes, power tools and temporary storage of things like Christmas Gifts can all make our garages a tempting target for thieves. This combined with the economic situation has meant levels of garage thefts have been increasing. For some reason homeowners appear to have a blank spot in relation to garage security – we forget to lock our doors and often take no steps to improve the physical security of our garage doors and windows. A standard garage door will probably only have a traditional simple cylinder lock located in its handle. These are not very secure; taking very little effort and virtually no time to force open. Thieves know this too so they are not an effective visual deterrent either. There are some very simple ways to improve the security of your garage doors and anyone with a drill and some basic DIY knowledge will be able to fit additional security. If you have an electric garage door speak to the manufacturer before you try to fit additional security. If you don’t you might end up damaging the motor or invalidating your warranty. Locking garage door bolt kits are sold in every decent hardware shop and their main componet is a pair of bolts with a lock opened by the same key. These bolts are compatible with most types of garage door, that includes the up and over design, the sliding garage, the hinged and folding garage doors up to 38mm thick. The bolts are fitted to each side of the door where they can be mounted horizontally with bolts extending into a wall or vertically where bolts can be shot into the ground. For standard up and over doors each door bolt should be positioned at the bottom corners of the garage door – approximately 250mm up from the ground – and at least 20mm away from the door edge. 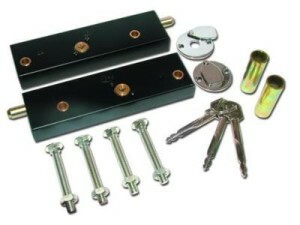 This allows the door to be freely opened when the bolts are in the unlocked position. The keys are used to extend the bolts from an unlocked position of 20mm from the lock case, to 35mm with the first turn of the key increasing to 55mm with the second turn and then 70mm with a complete rotation of the key. The benefit of this is that it offers great levels of security coupled with flexible fitting. We love the ultimate handy man – check out his excellent video to see in detail how you fit these locks. As these garage bolts can be operated from either side of the door, security can be further increased by not drilling an outside key hole if there is access to the garage by another door. For anyone with two or more garages, these garage door locks can be supplied so the same key is used to operate any number of garages. 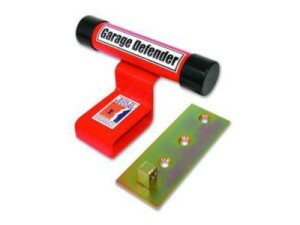 These provide a mix of physical and visual security for the up and over designed garage doors. The bulky presence of the defender locks is an effective visual deterrent. A padlock is used to secure the defender unit into a solid steel base which blocks the tilt action of an up and over garage door. These locks are easy to fit by any competent DIYer and should not take more than an hour to fit. The rear section of the defender base plate should be positioned under the garage door. Then, before drilling any holes into the ground, the installer should make sure the door swings clear of the padlock. The base is then bolted to the ground with supplied expanding raw bolts, 100-130mm of good solid concrete is recommended outside the closed garage door. If tarmac or block paving is present a built in base can be used, this will require a hole with a depth of 250mm to be excavated, then filled with a good three-to-one cement mix. If you are not sure what these garage locks look like or how much they retail at have a look at these examples which should give you a good idea. Look for models that have been given the sold secure seal of approval – this means that they have passed rigorous tests and evaluations set by an independent security product testing company.